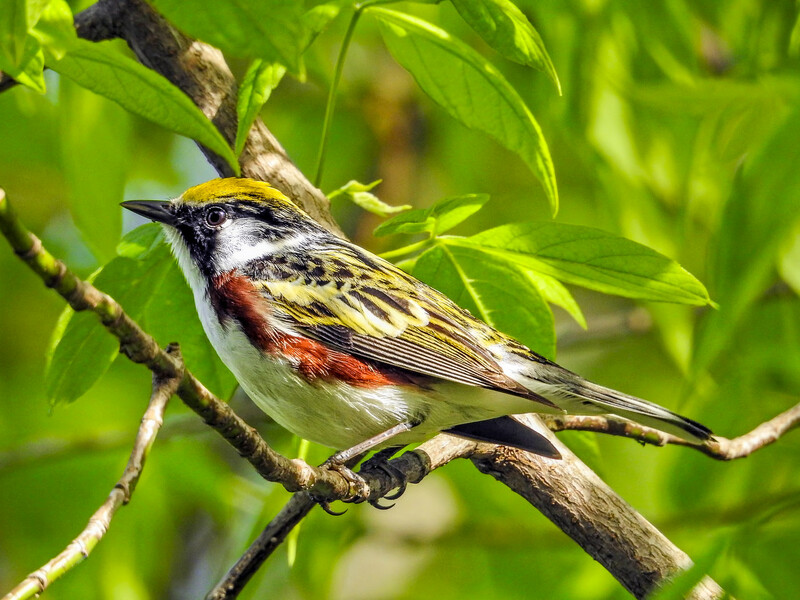 No matter what camera and lens you use, it simply does not get any better than this Chestnut-sided Warbler with the Nikon P900 Point and Shoot Superzoom! At the recent Biggest Week in Birding on the shores of Lake Erie in Ohio, I had the opportunity to teach two sessions of Point and Shoot for Warblers. Most photographers would agree that there are no more difficult birds to shoot than our wood warblers. They are fast. They are active. And they feed, during migration, deep in the spring foliage, from eye-level to canopy top. If they were not so bright and beautiful they might no be worth the effort. But they are…bright and beautiful, and though they might present a challenge…definitely worth the effort. For those of us who have chosen Point and Shoot superzooms, the challenge might seem greater due to the supposed “limitations” of our cameras. However, I suspect, based on my own and others’ experiences, that a proficient Point and Shooter, using a light weight, portable, flexible superzoom, can bring back as many satisfying images of warblers as anyone, if not more. And the best Point and Shoot warbler shots are every bit as good as the best shots from a full-sized DSLR and long lens. Every bit! 1) Finding the Bird. Use your eye-level electronic viewfinder, not the LCD on the back of the camera. This gives you a better chance of finding and keeping the bird in view as it moves thorough the foliage, and, since the camera is braced on your face, and a natural extension of your head, it gives you a steadier shot when you do shoot. While EVFs on Superzooms still are not great, the most recent Superzooms (Nikon P series and Canon SX60HS) have the best EVFs, and getting pretty good…I was generally able to easily find and track a warbler with the EVF on the Nikon P900, even in dense foliage…something that was not true a superzoom generation ago. 3) Focus and shooting. When you find the bird, you will half press the shutter to establish focus and exposure. Yes you will! You will not jam the shutter button down and hope for the best…you will half press the shutter. And then, if the bird allows, you will wait for the moment of stillness between breaths to shoot. 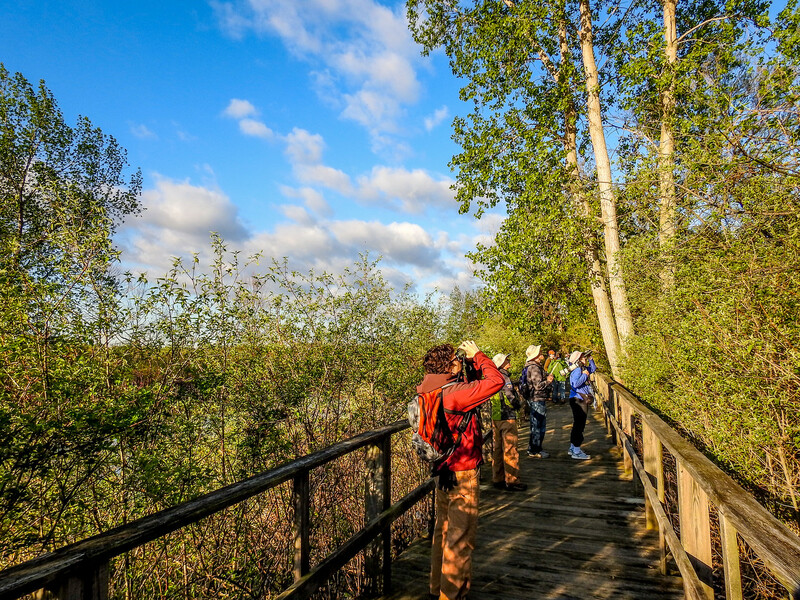 Yes I know, we are talking about warblers, and wait is not a word warblers understand…but believe me, your keeper rate will improve if you can learn to only press the shutter when the camera is already focused and the bird is in sight. You can jam the shutter down 1000 times and get 1000 blurry images of departing warbler butts, or you can develop your skill and patience, wait for the camera to focus, and only take an image when everything is right…and you will still take 400 images…and 50-100 of them will be sharp and satisfying. 4) Steadying the shot. Remember you are not a tripod! You will never keep the camera perfectly still. You are an extension of the cameras image stabilization system. The best you can do is to develop a sense for the still spot, when everything is lined up, and it is time to shoot. 6) Focus Area. When Superzooms come from the maker they are preset to use “wide area” or “multi-spot” focus. Some are set for “target finding focus.” That means that the camera tries to determine what is important in the scene and focus on that. Most superzooms are programmed to look for, in order of preference, a) a face, b) the closest high contrast object or subject, and c) the closest bright/colorful high contrast object or subject. In all superzooms this is the default focus setting in Auto Mode. And it works pretty well, getting focus right about 70% of the time. 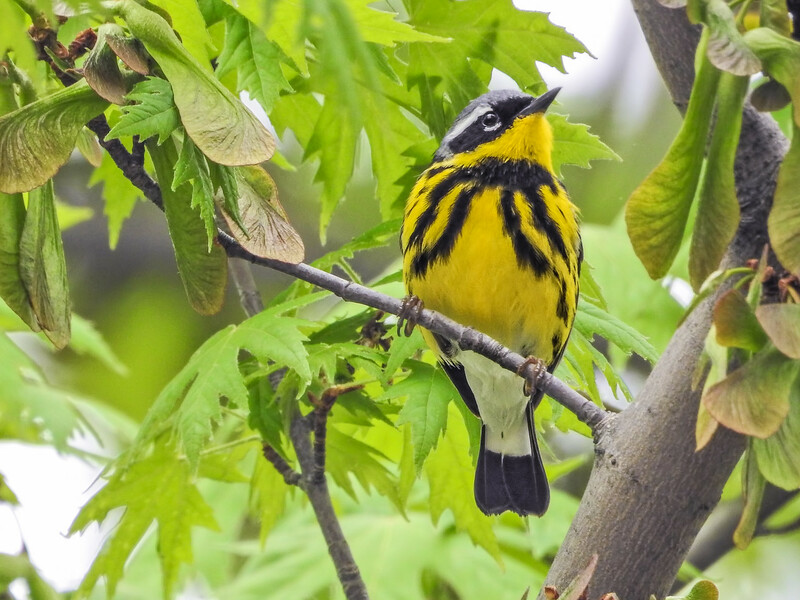 However, we are shooting birds and wildlife…or warblers in this case…and, without resorting to manual focus, we want more control over what the camera chooses to focus on. The following shots demonstrate the all but miraculous ability of today’s superzooms to auto focus in super difficult situations. 7) Focus technique. Once you focus area setting is set to small, you will attempt to put the little square on the bird, not on some element of the foreground or background. It does not matter much which part of the bird, as long as you include some portion of the body. In my experience, there is still a lot of intelligence built into the auto focus of a superzoom, even when you have it set to a small area. The camera will focus through low contrast foreground foliage and even twigs, if the bird is bright or high contrast enough, and takes up enough of the frame. This is especially true if an eye is showing. The auto focus of Point and Shoot cameras is keyed very tightly to the presence of an eye in the frame. The hardest thing to focus on is a low contrast, or totally backlit bird…like a Grey Catbird sitting against the sky, for instance. 8) Exposure. Just as you can change the focus area in Program Mode, you can also change the area the camera uses to establish the exposure. The default is Multi-Area Metering, where the camera takes exposure readings from many areas of the scene and then computes the best exposure it can. With birds and wildlife, we often do not care about the background or foreground as long as the critter is correctly exposed. Therefore, open your menu and find the setting for Exposure Mode. For feeding warblers in foliage, either “center” or “spot” generally works best. Spot will be more accurate on the bird itself, but center may give you the best overall exposure. 9) Finding the bird, part 2. The problem with warblers, as mentioned above, is that they move and they bury themselves in foliage. That makes it very difficult to find them at the high magnifications available with today’s superzooms. There are two solutions. a) especially on your first attempts, you may have more success if you do not use the long end of the zoom. 🙂 Keep to 600-1000mm or so, and the warblers will be much easier to find and keep in view. You may have to crop the images after to get the scale you want, but that is better than not getting the images at all. 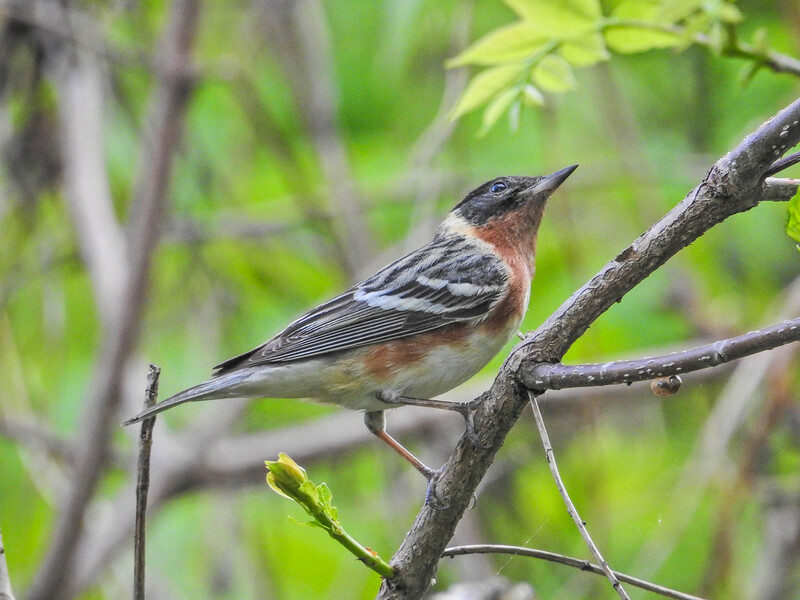 With feeding warbles, especially in places like Magee Marsh, 1000mm is often plenty anyway, as the birds are feeding within 20 feet of your face. b) if you camera has it, use the “framing assist” button or function. This is generally a button on the zoom barrel that, when pressed, auto zooms to zoom out to a wider view, while indicating in the finder what area your zoomed in view will cover. Releasing the button automatically returns your zoom to the longer setting. “Frame assist”, find the bird, get it in the indicated smaller area, release button, shoot. Even if your camera does not have a framing assist function (sometimes called the “zoom back” button), you can accomplish much the same thing by manually zooming back to find the bird, centering it, and then zooming in for the shot. Finally, when the bird moves out of the frame…do not try to find it by swinging the camera around at high zoom. Take the camera away from your eye. Locate the bird. Then reframe, using framing assist again if necessary. 10) Continuous Shooting. You will have much more success with warblers, or any other active subject, if you take bursts of 3-5 images rather than single shots. Bursts simply improve the odds of getting a sharp image…and they give the bird a chance to rearrange itself into a more attractive pose. You would be surprised how often that happens as you shoot your burst. Most Superzooms have at least two continuous shooting modes: high speed burst, and standard or low speed continuous. High Speed burst is the one they advertise, as it takes 7 to 10 images at 10 frames per second or more with a single press of the shutter button. Impressive! And practically useless for the bird or wildlife photographer. What you end up with is too often 7 to 10 identical images. There is not enough time for the subject to do anything between shots. Then too, the camera takes all the shots and stores them to a “buffer” (special memory location). It then stops everything else and processes and writers those images to the card before you can continue to shoot. Awkward. It can take from 30 seconds to 7 seconds to write to card…and that is 7 to 30 seconds when your camera is essentially a brick. Slow speed continuous, on the other hand, on most cameras, takes between 2 and 3 frames per second, and stores many more images in the buffer before it has to dump to card. The slower speed gives the bird (or bear) time to rearrange itself, so you get unique shots, and you can generally shoot off several bursts of 3-5 images before the camera takes a processing and writing break. Most of the time you will not be aware of the pause since it happens when you are not shooting anyway. The Canon SX60HS is an exception. It shoots 6 fps, continuously, without pausing for writing to the the card…though it does slow down significantly if you overwork the shutter button. You can generally find the Continuous shooting settings in the regular camera menu…though High Speed Burst is sometimes hidden in the Scene Modes. 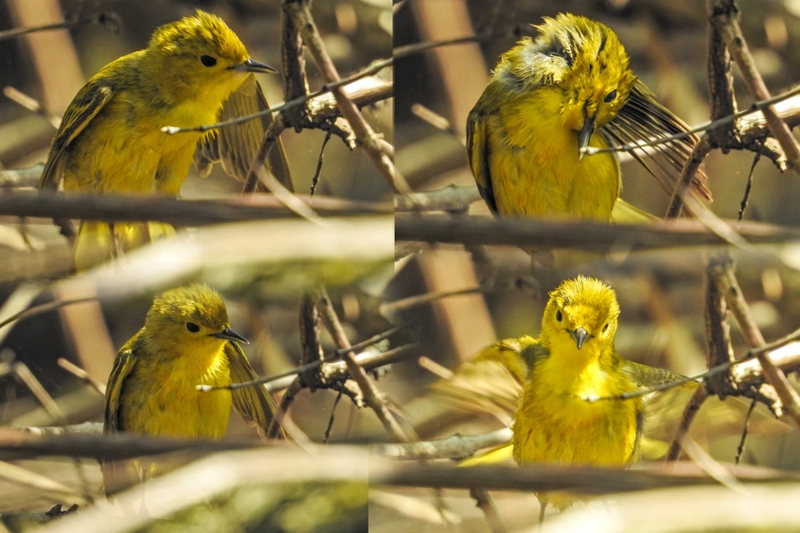 A panel of continuous shots of a Yellow Warbler bathing. 11) Keep trying. (And yes, it does go to 11 🙂 It always takes me several days at Magee Marsh to get my warbler eye in, and retrain my body for the challenge. Do not give up the first day you attempt warblers. Keep at it. Shoot a lot. If you keep 300 out of 3000 warbler shots, you will be doing very well indeed. Do not worry about the shots you missed…even of the best birds. The missed shots are gone. Just keep shooting and be really, really happy with the shots you do get. The more you shoot, the better you will get at it and the more keepers you will take home. Remember, having worked with all kinds of photographers, and having seen the work of many others, I can honestly tell you that your best Point and Shoot Superzoom warblers and their best long-lens warblers will be very similar…in most cases, not distinguishable at all…and you are likely, due to the compact size, portability, and flexibility of the the superzoom, to come back with way more satisfying images than the long lens crowd. Be happy! Be a happy Point and Shooter. Be warbler happy! How are your images so good? In mine (with the Sony Hx400v) the bird only takes up about a fifth, and is never that detailed. They are always taken at ISO 1600 or above because that, with a shutter speed of 1/500 is the lowest I can get. Any tips? I found this article of yours very illuminating and filled in a few holes for me. I own the Canon SX101S which has the 20X optical Zoom and by extension [Digital } I can get to 80X. On the odd occasion I either use a bean bag on top of the car or I drag out my trusty Slik. This is the only way I can get a decent image. The Mono-Pole is useful but mainly at the 20X. Which brings me to my main complaint with the Canon and that is the Macro function which does not work despite Attention by Canon. It works ok in MF though. A software glitch they presume. My interest is Macro. subjects, anything small but analysis of printed circuit boards are highest. Which brings me back to some comparisons you made re the NIKON P900 and the older Canon SX. I have seen the TV marketing adds down here in Hobart [Tasmania Australia ] demonstrating the P900. The ad is annoying, a cackling female and a idiot male support. What I found interesting was the fact that it was Wi-Fi compatible. It did not show this feature in the Demonstration. My question here is ? is Wi-Fi a gimmick or is it a useful function. Could I control the camera via my iPad or Laptop? What are your recommendation’s for this camera and my usage. Is there another camera along the features of the NIKON that might better suit me. Your advice appreciated because we no longer have any High Street Camera shops now in Hobart. Only the big chain stores who are happy to drop the box in your trolley but cannot answer a basic question on the product. Wifi on the P900 is pretty well implemented and there is a control app for iPhone. I don’t have it and have not used it, so I can’t comment on its usability. Macro on the P900 is decent. Very close focus at 24mm, and useful macro out to about 100mm, but if that is your primary interest, then you do not need the long zoom of the P900. You would get the same results with the P610 at macro distances…for a lot less $$ and in a much smaller package. The best macro implementation I have seen is on the Canon SX60. True macro 24mm to over 200mm for a great range of working distances. Hope this helps. I think the decision is for the the Canon. I have the sx50 and have taken great shots with it. What I dont like is the the evf and the grip on the camera. I find it very hard to hold. How is the grip of the P9000 compared to the sx50 and the evf? I take pictures of my kids sports both inside and outside and love the ability of the the long zoom. So Im looking for better EVF, ergonomics and hopefully better low light. The P900 is much bigger than the SX50 so the grip is completely different. It is the size of a full sized DSLR. The P610, and the new B700 are the size of the SX50 but have a better grip. The EVF in all of the Nikons is far superior to the SX50. I find the sx50 is just so small to hold Im constantly trying to find a good hand hold. Im not against a larger camera just one with a deeper grip I suppose. Glad to hear the view finder is better!! I have used the canon 7D mark 2 and love it but not willing to invest in the zoom lenes lol. So my hunt for a replacement to the Sx50 continues. What is your thoughts on low light shooting with p900? Just one query regarding Auto Focus – what would you recommend AF-single or AF-continuous? I have now used the P900 for 10 months and it is really an amazing camera. I just saw your blog and your lovely focused bird shoots. Then I were thinking if you ever noticed a problem with manual focus. I tested to take some moon pictures in manual mode, manual focus and without using vibration reduction, of course used a tripod. The weird thing is that when I zoomed in nearly to max and adjusted the focus I could see very clear focus of the moon for a short time, less than 1 sec, but then it was gone and left me in a state that was not blurry but not clear either. Really annoying. Perhaps manual focus is out of scope taking pictures of fast moving birds but hope someone out there could have some experience in this behaviour. Sorry but I never use manual focus so I don’t have anything useful to add. I just got the Sony RX10 iii. I am trying to learn how to use it before the Ohio Magee Marsh birding trip in May. I got an extra Sony battery. Do you think two batteries will be enough for a day of bird photography in this camera? Any tips on how i should set up the camera settings? Two batteries should last a day, but you should get an external charger so you do not have to charge the batteries in the camera…that will make life a lot easier, and if you only have two batteries there will be nights when you have to charge both. As to settings, see my recent post on Settings for Wildlife, macro, etc. Thanks Steve! I’ll get an external battery charger. 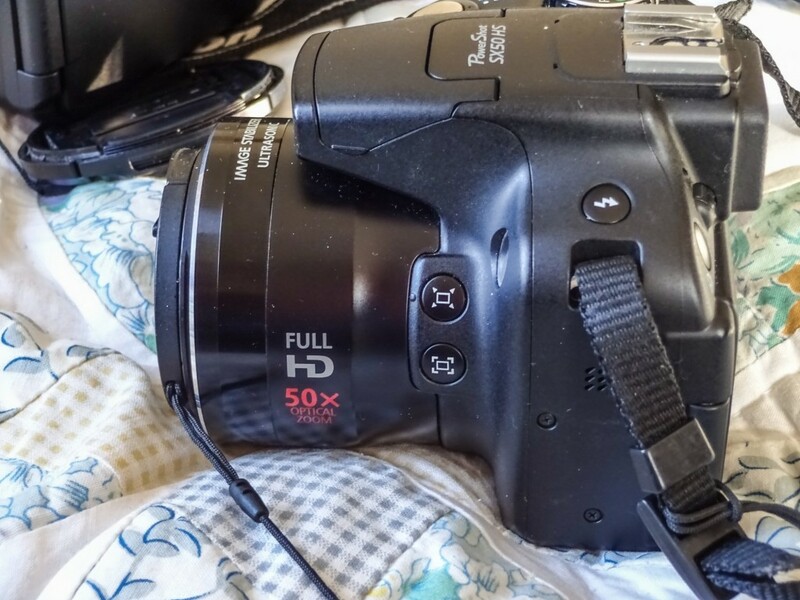 I have P 900 and getting blurred images.I am using this camera at shutter speed of 1/2000 (To get sharp images) with ISO 800 -1600 (To compensate the exposure) with auto focus but sill getting blur images even in full light. Is there any direct relation of vibration Modes (Normal,Active,off) with shutter speed which direct effect on sharpness of images ? I have not noticed and direct effect of VR modes on sharpness. You should get no blur at 1/2000th unless you are too close for the 16.5 foot close focus. The VR is good enough to give you sharp images at much lower shutter speeds, down to 1/125 at least. ?? I have really enjoyed your techniques articles but have a couple of questions. You said to set the Noise Reduction to Low. I am assuming that is for bright light only and you would need to put it higher if shooting in low light and high ISO. Also do you have any suggestions for photographing in the dark conditions of a rainforest. I am going to Ecuador in February and am concerned about being able to get good photos there. I use a Nikon B700 so the settings are the same as the P900. Also, when is your next P and Shoot photo trip to Costa Rica? I think on the Nikon’s you can only adjust NR for high ISO, not in general. I still recommend low NR even for low light and high ISO. You can do a better job, if needed, in Post Processing using specialized NR tools than the camera can. For rainforest, I generally use Auto ISO. Better to keep shutter speeds at a reasonable level as some kind of shot (noisy) is better than no kind of shot (fuzzy due to camera motion). There is not much else you can do for the light levels in the rainforest…though the B700 should do quite well…it is very efficient in the way it uses the available light. Focus will sometimes be a problem. That is where you may have to reframe on a sharp edge at about the same distance as your subject, let the camera find focus, and then return to your subject to try again. You may have to back off from full zoom to get the camera to focus at all. In really low light, however, you are just going to miss some shots when the camera will not focus. Shoot a lot. Don’t regret what you miss…celebrate what you get. A monopod might help, and it makes a good walking stick anyway. Enjoy Ecuador. I have only been to the Galapagos and the Andes…nowhere in between. Costa Rica? I am looking at December of 2018. Let me know if you are interested.